In spite of outcry from government banks and cyberpolice worried about connections to Internet crime, the Bitcoin just keeps on trucking, with more and more sellers accepting the digital currency. 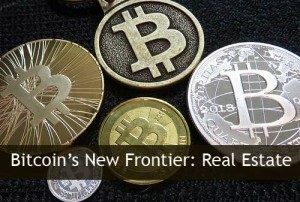 But the growing use of Bitcoin for buying real estate is raising concerns about the digital coin’s staying power and stability. Bitcoin’s splashy entrance into the real estate market came with the announcement in the spring of 2014 that the owner of a Southampton, NY property priced at nearly $800,000 was wiling to accept cash in traditional funds for the property or the equivalent in Bitcoin. The German-born owner of that Southampton property isn’t the only one willing to take the controversial virtual currency for a real estate transaction. Sellers in Indonesia and Latin America, where Bitcoi is big, are also letting buyers know they’re willing to take Bitcoin for real estate. But the volatility of Bitcoin has housing professionals worried. About the implications not just for these sellers, but for the housing industry as a whole – and for the investors working to build wealth through income property investing. Too see why, let’s look back at the Bitcoin. You’ll find numerous articles about it right here in our archives, because Jason Hartman’s watching its progress. Bitcoin was created back in 2009 as an experimental digital money that anyone cold use, anywhere in the world, without connections to any bank. The Bitcoin’s popularity spread, especially in countries whose own currencies were unstable, and as it gained traction among larger groups of merchants and sellers willing to take payment in Bitcoin it became a legitimate commodity in the world’s money markets. Prices fluctuated wildly, at some points reaching as high as $200 per coin. But with that newfound celebrity came troubles. Bitcoin exchanges were accused of money laundering, and the anonymity of the coin made it ideal for use in illegal transactions everywhere in the world. State banks and monetary authorities issued stern warnings and refused to deal in Bitcoin. The hostility of major financial institutions and governments toward Bitcoin and other digital currencies like it have triggered fears among some Bitcoin supporters of a major effort to kill the coin entirely. But others point to the continuing spread of the coin into areas like real estate as evidence that it’s here to stay. But while conducting a transaction like buying real estate with Bitcoin seems simple, it comes with complications beyond the initial exchange. The Southampton seller says he included the Bitcoin option to broaden the range of potential buyers and give buyers an additional option. And as long as the Bitcoin sale is treated like a cash sale, real estate professionals point out that it could work. After all, the only requirement for a successful Bitcoin transaction is that both parties agree on the price and the terms. But the very anonymity of Bitcoin makes it hard to create safeguards around such as sizable exchange. Bitcoin is backed by nothing, and its value fluctuates wildly. A hundred thousand dollars’ worth of Bitcoin today may be worth a hundred, or a thousand, in the next few months, leaving the seller with no return at all. Credit checks on Bitcoin buyers of real estate are also useless. Since Bitcoin transactions don’t appear on anyone’s FICO report, it’s impossible to verify a buyer’s reliability. And there’s no recourse if the deal goes sour. That’s another reason Bitcoin is loved by illegal traffickers of all kinds. Another obstacle in using Bitcoin to buy real estate is the number of ancillary transactions that go along with any kind of housing sale. Inspections, title searches and transfers, legal fees and permits are all al pert of buying am investment property – and those entities probably wont accept Bitcoin, so funds for those transactions will have to be carried by the parties involved, even if the main sale is done via Bitcoin. For now, Bitcoin transactions for real state have been limited to relatively expensive properties, ones that could equally easily be purchased with cash. And cash is still king n some kinds of real estate purchases, pushing out those buyers who have to work with lenders to take out a mortgage. As Bitcoin continues to make inroads into the world of real estate, should investors get on the bandwagon? The answer depends on a lot of considerations. If you’re a Bitcoin enthusiast who wants to help promote its use, there’s a growing list of sellers willing to meet you halfway. Experts point out that sellers willing to tae Bitcoin for property – or any other high-end purchase – may want to consider immediately rolling those Bitcoins over into the purchase of some other tangible thing, such as another property or other substantial item. That ensures some protection against a Bitcoin crash and burn that leaves you holding a virtual wallet full of nearly useless virtual money. If a property you want can only be had by Bitcoin, it’s relatively easy to get some. Bitcoins can still be “mined” – produced using the complex algorithms that set the number of Bitcoin circulating. If you don’t have the patience, computer power or expertise to mine Bitcoins simply engage or sell something for Bitcoin or pull out your real wallet and buy some Bitcoins from an exchange. Bitcoins are then added to your online wallet and then transferred to the seller’s account when the deal is done. Fees for Bitcoin transactions typically run much lower than those charged by banks and other institutions. What happens to your Bitcoin stash come tax time? The IRS and other authorities continue to grapple with how to classify them, but for now they’re being treated as property, not as assets. That’s another consideration in large volume Bitcoin sales.